Materials Needed: beeswax (not paraffin or candle wax), crock pot (2 qt. size), old paintbrush specifically used for waxing, art canvas or other surface (on this page you will see I included 3 collages, 3 greeting cards, and 1 assemblage using the beeswax). Technique: Coat the surface with melted wax using an old brush (I purchase the cheap bristle brushes from home improvement store).. 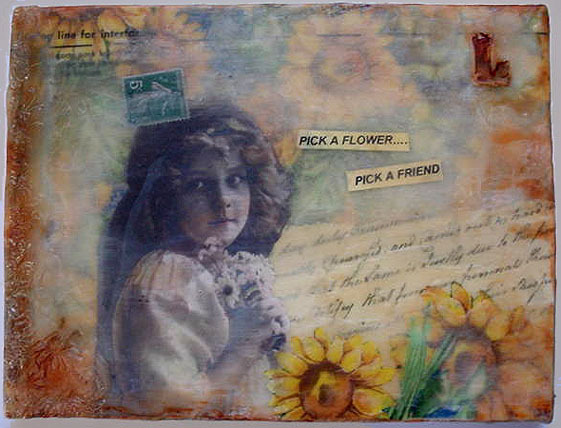 Begin by creating a background for your collage or project. Translucent tissue paper from a dress pattern works perfectly. Press a large tissue paper scrap over the wax. The wax hardens quickly - not to worry. Brush wax over the collage piece and the edges of your canvas. This will adhere the collage piece to the canvas like glue. Now you can begin adding a figure and collage elements on the background. 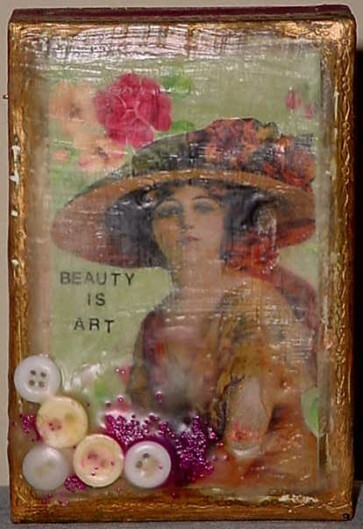 Brush over the figure and collage elements with more wax to glue down. 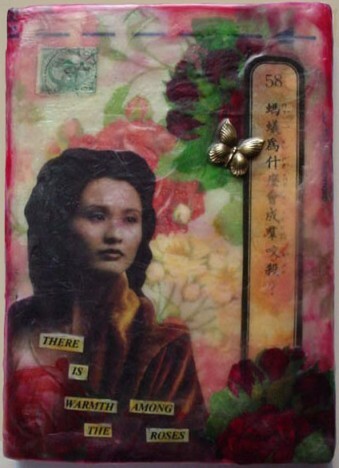 Through my experimentation, I discovered I love using museum-quality decorative napkins as backgrounds on some of my beeswax collages. I first adhere a napkin (be sure to remove the two supporting layers) to the collage using gel medium (matte) and letting it dry on the canvas first. Then I start layering with the tissue paper. 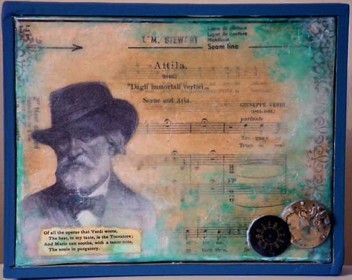 It really creates a lovely soft background.. For the background of the the Verdi collage, I used a piece of an antique music sheet, then the tissue paper over that. Once you have finished waxing the collage to your satisfaction, you can use a quilting iron to "press" the wax evenly over the collage. If you're using the beeswax for making greeting cards (3 shown), just trim your image (either a color copy or stamped image) as desired. 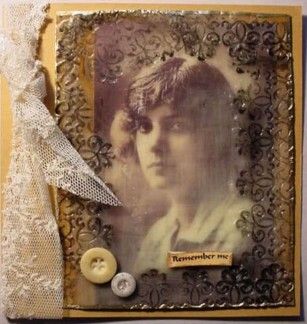 Use your brush to apply a small amount of hot wax on a piece of sturdy cardstock. Quickly place the picture or stamped image on the wax to secure it in place. Evenly brush wax over the photo, continuing until you can barely see the image, keeping the edges as even as possible. When the wax has set, carefully scrape through the wax to reveal the image, especially around the face. Leave wax thicker on edges. Add texture by scratching lines into the wax with a craft knife. On edges, soften the wax with a heat tool, stamp texture stamps for design into the edges of the wax. I found a solvent ink works best for this (Black or Brown). The stamp can be cleaned by using heat tool then wiping quickly with a paper towel. Trim cardstock evenly around the waxed area. 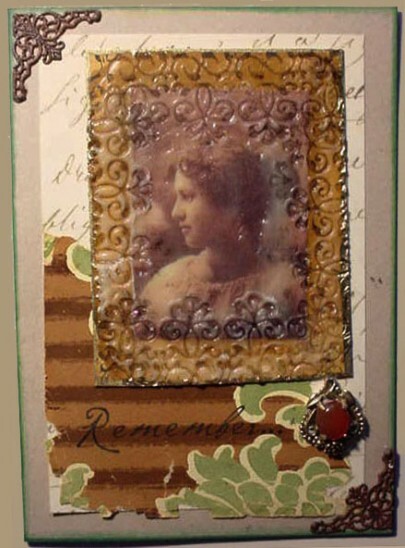 Affix the finished piece to the cardstock of your choice and embellish as desired. TIP: Adhere the waxed piece to cardstock using heavy double-stick tape as the piece will be rather heavy. I use carpet tape. 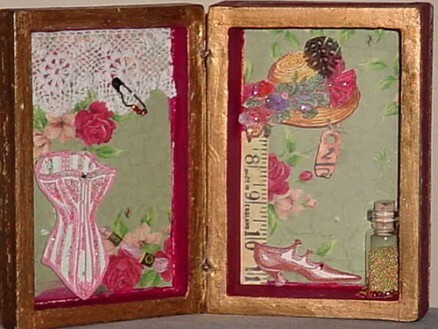 For the assemblage: I used beeswax over the top of the box after I was done with the collage. I used the same technique as for the greeting cards. The beauty of the wax is it has multi-purposes. Not only does it leave a very soft and lovely, cloudy appearance over a piece, but it also serves as a glue. If you want to add 3-D elements, just add more wax to your piece, when wax is still soft, add your elements. Brush over with a fine film of more wax to secure. The main thing is to relax with the wax and I'm sure you'll be as comfortable with it now as I am. And, if you believe in aroma therapy, you'll love the smell of the melted beeswax while your creating! 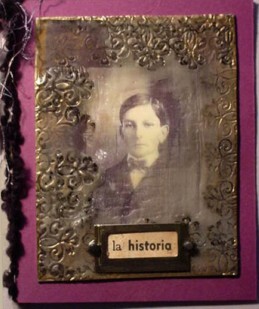 I am a self-taught mixed media artist residing in Schenectady, New York (15 miles North of Albany). I live with my husband, Ted, who I wouldn't be doing what I'm doing without his love and support and we have a 5 year old beagle, Katie, living with us. We have 5 children between us (all grown). I teach stamping and art classes at my favorite stamp store Stampassion in Loudonville, New York and contribute regularly to the Collage Cat Zine. My passion and love of art has opened many new windows of opportunity for me and the one of new friendships is my favorite.